Rochester Institute of Technology has received a $3 million gift to conclude the Saunders College of Business Challenge initiative. The donor is RIT alumnus Joseph M. Lobozzo II ’95 (Executive MBA), founder and former president/CEO of JML Optical Industries Inc.
Lobozzo’s gift concludes the business school’s $20 million Saunders Challenge that started with a challenge gift of $5 million by local entrepreneur/philanthropist E. Philip Saunders. The business school namesake subsequently issued a call to action—inviting alumni and friends to raise support for the college’s visionary plans to create a new environment for business education at RIT. Earlier this year, Lobozzo was honored as the recipient of the 2017 NRS Award, the highest honor given by RIT’s Nathaniel Rochester Society, the university’s donor giving society. “RIT is one of Rochester’s bright shining lights and covers a whole spectrum of learning—including the business school’s Executive MBA program, which reeled me into getting a degree in its first graduating class,” Lobozzo said. “I kept thinking that it would be nice to complete Phil’s commitment to the business school and help Jacquie and her vision to take business education in new directions. Lobozzo’s commitment to RIT has been legendary. He has served on the RIT Board of Trustees (1999-2013); advisory boards for the Center for Integrated Manufacturing Studies, Venture Creations and Saunders College Executive MBA program; and several terms on the Dean’s Council for Saunders College. He also served as vice chair of RIT’s Powered by the Future capital campaign, and established the Lobozzo Executive MBA Challenge Scholarship. Lobozzo’s support is also marked by years of personal giving, including the establishment of the Joseph M. Lobozzo II Photonics and Optical Characterization Laboratory in 2006 at the Kate Gleason College of Engineering. 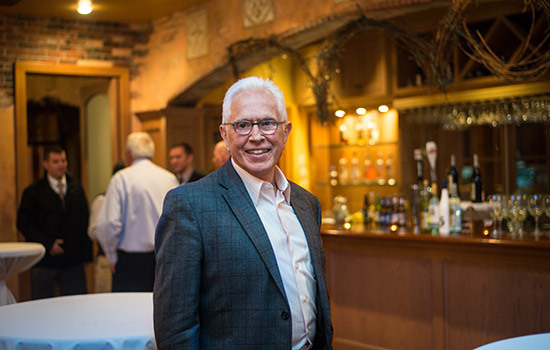 For his years of business success and service to the university, he also earned the Saunders College Distinguished Alumni Award in 2001, the Herbert W. Vanden Brul Entrepreneurial Award in 2003 and the RIT Outstanding Alumnus Award in 2006.